Find the best floor cleaning and maintenance products for your floor with the company that specializes in floor care and has tons of flooring expertise from floor installation know how to maintenance and floor protection solutions that work. Find the products you need to care for your floor, within the family of FloorConsult companies - SchutzPro NE, Hilway Direct Floor Maintenance Products or the 1877FloorGuy Retail Store. Floor Maintenance products are for sale to end users, facility managers, flooring industry consumers, resellers and flooring installers. Floor care supplies can often be discounted for bulk purchases. Distribution source will depend upon the product line. Dr Schutz products must be applied by a certified applicator. Direct your inquires to Floor Consult via email or telephone. 1877FloorGuy.com is the FloorConsult company that has been selling retail floor care supplies and equipment since 1999. An easy to use website allows both residential and commercial customers to shop for floor cleaning and maintenance supplies online at any time that’s convenient for them. Customer Support is available to assist customers Monday through Thursday, 9am to 5pm and Friday, 9am to 4:30pm. The support team at 1877FloorGuy is the best there is at helping customers to understand the options when it comes to cleaning, finishing and protecting their specific brand and type of flooring. Serving both homeowners and business owners for close to 20 years, 1877FloorGuy has a high level of floor care expertise ready to share with customers. 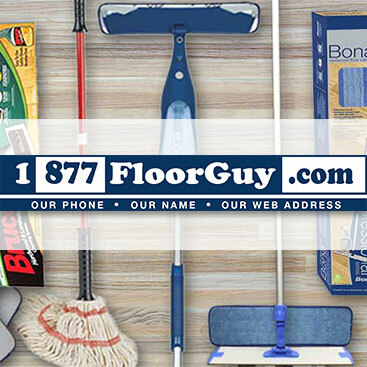 Call 1877FloorGuy at (877)356-6748 or send an email to help@1877floorguy.com, to get accurate information about the supplies you need to maintain your floor in the best possible condition or browse the website for helpful articles and blog topics. Shop for floor cleaning supplies on1877FloorGuy.com to find cleaners, maintainers, furniture floor protectors, heat welding tools, floor machines, rotary pads and more for all types of floors including LVT, sheet vinyl, hardwood, stone tile, laminate, linoleum, rubber, and even carpet spot cleaners. “Convenient” and “easy to navigate” is what our customers say in store reviews about their experience shopping on 1877FloorGuy.com. With more than 1000 products in our store, you are sure to find what you need to meet your floor care needs. Hilway Direct Floor Maintenance Products are professional quality floor cleaning and maintenance products for use on luxury vinyl sheet, plank & tile, rubber, linoleum, quartz tile, pvc-free and other resilient flooring materials in homes and businesses alike. Hilway Direct makes it easy to find top quality floor cleaning products and a unique array of finishes for typical use to extremely hard wearing floor applications. 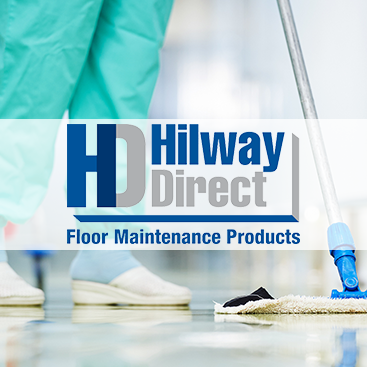 The Hilway Direct website provides detailed information on the Hilway Direct floor maintenance products. Neutral Cleaner, Matte and Satin Floor Finishes, Plus and Primo cleaner maintainers and finishes can be found at 1877FloorGuy.com for retail sales. Bulk quantity purchasing inquiries can be directed to help@floorconsult.com. Used by households and businesses throughout the US and Canada, Hilway Direct Neutral Cleaner easily cleans LVT without streaks or haze and professional Hilway Direct floor finishes provide extra protection against scrapes and scratches on the floor. To understand more about how to choose the right protective finish for your LVT, rubber or other resilient flooring and how to apply Hilway Direct floor maintenance products, reach out to us in one of the following ways, email to help@floorconsult.com, help@1877floorguy.com or call the helpful 1877FloorGuy Customer Support Team at (877)356-6748. You’ll get answers to your flooring questions and clear direction on the best way to clean, protect and treat your floor. SchutzPro NE provides regional distribution and application of specialized Dr Schutz polyurethane-based flooring finishes, anti-slip floor coatings, stain-resistant flooring sealer, customized creative design collection and colorize designer floor color treatments to commercial facility end users and to Dr Schutz Applicators in the Northeastern United States. Schutz NA permanent floor finishing products are almost exclusively for commercial and institutional environments and must be applied by a Dr Schutz trained applicator. Often specified for use in high traffic facilities or in institutions that require a high level of slip resistance, Floor Covering Services & Consultants’ SchutzPro Northeast team has the skill and complete knowledge to help you decide if a Schutz high-performance permanent wear layer is right for your corporate, healthcare or institutional flooring application. As an authorized Dr Schutz sales agent, Schutz Pro NE is fully qualified to train applicators or to do the application of all Dr Schutz flooring finishes products. Have your own maintenance staff? 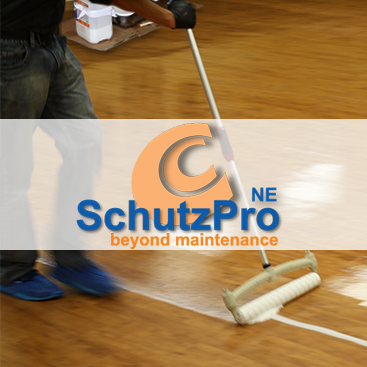 A SchutzPro expert can provide on-site training at your facility to certify your team to apply Dr Schutz permanent wearlayer finishes and teach them how to maintain the floors following application. Reggie Hill, at SchutzPro Northeast, is the go to expert in the United States when it comes to Dr Schutz wear layer floor coatings.